Creating special moments and experiences in an intimate yet energetic setting. Niche and unusual wines from exclusive producers from all around the world, a boutique wine service based in London offering dynamic wine tastings, educational workshops and intimate events open to all! From wine to wine, you travel through moments, stories, and terroirs, and at the end of the night, your luggage is an awareness of where you can wander next time. Whether along the typeface of a restaurant’s menu, or at a family gathering, wine is a personal array of sensorial experiences. Silvia’s events are centred around helping you understand how to interpret the diverse qualities that wine has to offer. A Divino in Vino wine tasting is not about a right answer from Silvia, but rather it is about expressing yourself freely, contributing your experiences to the table, and partaking in an open conversation with others. In this process, participants enjoy a mutual understanding of the wines tasted. Silvia becomes a storyteller, wine becomes the story to tell. But most importantly, she helps you see your own story through the wine. Divino in Vino is collaborating with Bedales Wines for WSET courses. Since 2015, Silvia is the leading educator for WSET Level 1 and 2 which take place at Bedales of Leadenhall on Saturdays. WSET was founded as charitable trust in 1969 to serve the growing educational needs of the UK wine and spirits industry which, at the time, primarily spanned import, distribution and retail. Funding was provided by The Vintners' Company and WSET took over the education initiatives started by the Wine and Spirit Association of Great Britain. Get 10% OFF by using the promo code "DIVINO"
Divino in Vino organises wine tours and experiences in the South African winelands in collaboration with Explore Sideways. Discover the very best of the South African wine regions from the Cape Peninsula, Constantia and cool climate Elgin to Stellenbosch, Franschhoek and the beautiful Swartland. Learn about the rich history of winemaking, discover organic and biodynamic farms and be spoilt with regional food & wine pairings as you sip the most exclusive wines that South Africa has to offer. Let a local, specialist guide take you off the beaten track and into some of the hidden gems that make this region a bucket list item for any visitor to Cape Town. Explore Sideways is a South African based wine tour company specialising in unique, handcrafted wine experiences. Each trip is accompanied with a specialist wine guide that will take you to wineries that are off the beaten track and often not open to the public. Everything from tastings to lunch will be pre-booked and planned to perfection so you can focus on having an exceptional holiday. For more information, please download the detailed itinerary, which outlines the schedule for each day. Explore Sideways has well-established relationships in the Cape Town region which gives us exclusive access to indulge in private experiences delicious wine memories. You can read more about them on TripAdvisor for previous guest feedback & Explore Sideways blog for stories of things in and around Cape Town. In the rare event that our company must cancel the trip, your full deposit will be refunded through Trust My Travel. Please see the attached Terms & Conditions. We have also put a list together of helpful info and list of things to do and places to book ahead of time. Click here! Divino in Vino collaborates with Hambledon Estate organising wine tours and experiences in the vineyard. 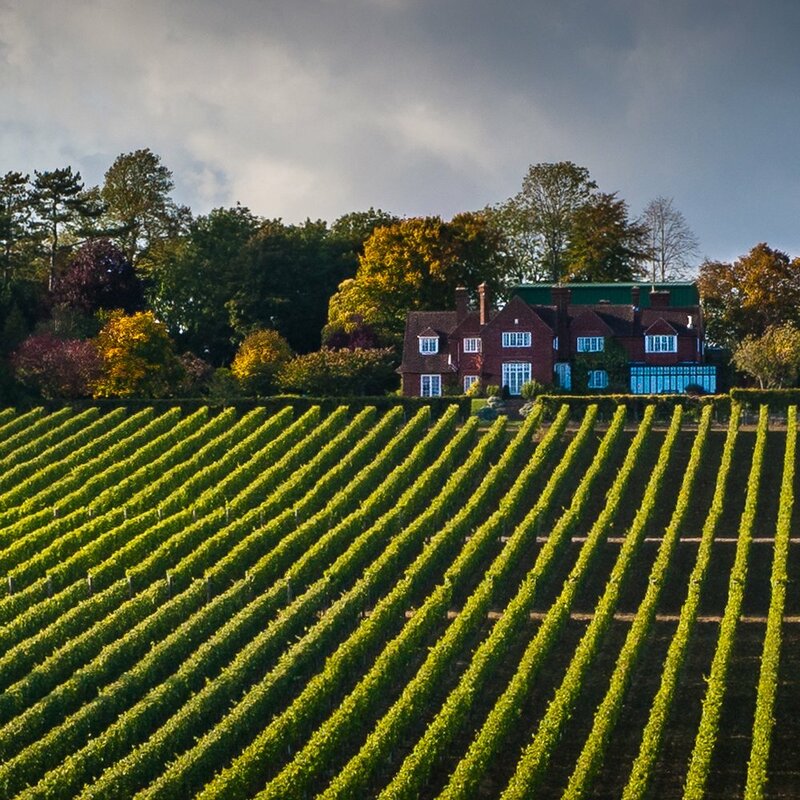 The vision at Hambledon is to produce the best multi-vintage sparkling wine in England that will make Hambledon and the local community proud and gain universal recognition from the global wine community. They believe there are two crucial elements to produce fine sparkling wines: using the best possible raw materials and working with the best winemakers in the business. The on-site winery opened in time for its first harvest in 2011 and it is the only fully gravity fed winery in the UK, allowing them to make wines with the minimal possible intervention. A full private vineyard tour followed by a tasting of the three sparkling cuvées that Hambledon has to offer. Min 6 people / Max 12 people. Price £25 per person. 2 hours. - Departure from London Waterloo train station. Arrival to Petersfield station (1 hour). Train tickets are NOT included and are about £30 return. - Taxis from Petersfield station to Hambledon Vineyard take approximately 15 minutes and are about £15-£20. Taxi tickets are NOT included and the cost will be divided within all the participants. - Tickets to the experiences are NOT refundable, only if the minimum number of people won't be reached, tickets will be refunded. Growing up in Florence, it was inevitable for me to be surrounded by wine culture. I began working at Studio Umami, a food and wine marketing agency, as well as putting into practice my knowledge at local wine bars. My submersion in wine grew day by day but with my insatiable curiosity, I needed a change of scenery. Thus began my chapter in London, where I became fully involved in the avid and energising wine culture present. I worked at Bedales as a wine specialist whilst studying for my Wine and Spirit Education Trust (WSET) Level 3 and WSET Educator Certificate. A trip to South Africa was all it took to shake up my previous relationship with wine. Travelling through the diverse landscapes, I was able to recognise that wine is indeed a very rooted product, which at times might be forgotten. The simple act of walking through a vineyard, picking grapes or talking to local wine producers cemented my understanding of the inherent beauty, process and complexity behind a bottle of wine. Wine is rusticity; it has something fascinating that brings you back to traditions and an idea of true values. Wine is travelling, exploring, learning. Wine is poetry and magic. Like me, unassuming at first, then exuberant.